In 1977, when George Lucas was taking the pulpy spectacular roots of US SF and making Star Wars, Andrei Tarkovsky was taking one of the landmarks of Soviet-era science fiction and producing a characteristically cerebral and symbolic art-house film. The year that Stalker was released marked the first appearance of the original book, Piknik na obochine, in English. Reading it now, Boris and Arkady Strugatsky's novel (translated by Antonina W. Bouis, who is not credited in this Gollancz Masterworks edition) is just as cerebral and symbolic as its cinematic counterpart, and as powerful and fresh as the day it was first published. Roadside Picnic spans eight years in the life of Redrick "Red" Schuart. Red is an uneducated man prone to drinking, womanising, and fighting; he is also a Stalker. Aged only twenty-three when the book begins, Red is already an expert in the dangers and possibilities of The Zone. The Zone is one of several areas characterised by the remains of a brief alien visitation. Now gone, the aliens left in their wake both advanced items of technology and areas where the laws of physics no longer apply, or where strange substances and forms instantly kill or disable any human that comes into contact with them. Unsurprisingly, the humans have set up an institute that delves into the Zone in order to extract technology. Equally unsurprisingly, the Zone also attracts illegal Stalkers who venture into the Zone without the technological safeguards offered by the institute but for whom the potential rewards on the black market are far greater. As the book progresses we follow Red as he first gets lured into the world of illegal Stalking and then, after a period in prison, as he prepares to venture deep into the Zone in search of a golden ball that is said to grant wishes. While some critics have been quick to project their own views about the Soviet Union onto this book and read it as a criticism of bureaucracy and planned economies, Roadside Picnic is in fact not immediately identifiable as a book produced under a communist government. Even the names of the characters are invariably difficult to pin down to one particular culture or even social class despite having a contemporary setting. The book could well be set in Russia but it could just as easily be set in Europe or America: Harmont is a town that has grown up around the Zone and has a much closer relationship with the Zone than it does with the outside world. The Strugatskys also tend to give their Stalkers nicknames such as "Porcupine," "Buzzard," or "Professor," further distancing them from the real world, where people have normal names, as well as cementing their relationship with the Zone, whose wonders also have quirky nicknames such as "mosquito mange" and "witches' jelly." The Strugatskys' fictional town is not meant as an indictment of Soviet towns and living; rather, it is a town where everything and everyone is defined by its relationship to the Zone. Red has his entire life determined by the Zone. As the book begins, he is defined by his superior knowledge of the Zone's dangers; later he acquires a wife and a daughter as a result of the affairs that he has whilst living the extravagant lifestyle of a Stalker. Red's relationship with his family is not just literally determined by his journeys into the Zone (as that is how he feeds his family and how he gets separated from them when caught by the police) but also symbolically, in the shape of Monkey. Like her father and the Stalkers, Monkey is known by her nickname, but rather than earning that name by venturing into the Zone, Monkey gets her name by being, much like the Stalkers, a creature of the Zone: a mutant covered in downy golden fur. As Monkey gets older, she changes from being an outgoing and affectionate little girl into an almost autistic ghostly presence that ambles round Red's house, barely acknowledging her parents' presence or their attempts at communication. The growing influence that the Zone has on her psyche is a mirror of the psyche of her father who, now in his early thirties, prepares to venture into the Zone in search of the golden ball. Each of these different ways in which the citizens of Harmont "point" towards the Zone suggest that the Zone is in fact symbolic of something else; it is not particularly surprising or interesting for a community surrounding something as weird as the Zone to be defined by it. 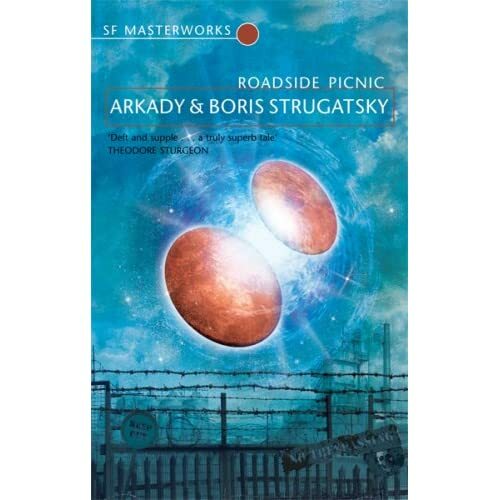 But in order to understand Roadside Picnic, we need to understand both what the Zone means to the fictitious characters involved in the narrative and what it means to the Strugatsky brothers as a part of their conceptual meta-narrative. The Zone is not a unique concept in SF. Indeed, as far back as 1960, Algys Budry's Rogue Moon was also an unreal place full of great rewards and deadly traps. We can also point to Frederik Pohl's Gateway (1976) (which is now, like Roadside Picnic, available as a part of the Gollancz SF Masterworks collection). While there are differences between the takes on the idea (Pohl's universe, for example, is far more comprehensible than that of the Strugatskys), all of them visit the idea of a Heterotopian Other-space completely at odds with the safety of the normal human world and only ventured into by those seeking psychological or material benefits that would not otherwise be accessible to them. In fact, the trope even appears in fantasy with the concept of the "dungeon" so popular in fantasy roleplaying games. The idea is an old one: all that changes is the aspect or the kind of Otherness that the writers want to accentuate. However, in many ways the Zone remains the clearest and most influential conception of the dangerous but rewarding Other-space. Last year's Nova Swing by M. John Harrison features an homage to the Zone in the shape of the Site, a place where the laws of logic and even sanity break down. Even in the real world, the concept exists: people who venture into the aptly named 1,400 square mile Zone of Alienation surrounding Chernobyl refer to themselves as Stalkers (there has even been a PC game named after them). If the golden ball represents a potential heart's desire then I would argue that the Zone as a whole can be taken as symbolising hope, aspiration, and the realm of possibilities and probabilities. Red is a character who, disillusioned with the ordered, overly precautious, and under-rewarding UN-governed means of exploring the Zone strikes out on his own. He wants to be in the Zone because in the Zone everything is possible. This is why he is distant from his family, and why the entire town of Harmont is oriented towards the Zone and away from the rest of the world: all are creatures of the Zone, and all would rather live in hope and aspiration than in the real world, the world of actualities and certainties, where even danger is sanitised and limited and controlled. With such a mindset it is perhaps unavoidable that Red should see his "normal" family life as somehow unreal and temporary. Because the Zone has such potential to change lives for the better and for the worse, the home life of Stalkers is only as good as the product of the last venture into the Zone. If takings are good then the life enjoyed by the family instantly becomes "the bad old times" of poverty, but should a Stalker return injured then they were the good days. So despite being all about potentials and possibilities, the Zone is ultimately the only true measure of a Stalker's life. The possible becomes the real and the real becomes the potential. When Red comes face to face with the ultimate font of possibilities, an object in the Zone that will grant him his heart's desire, he is unable to articulate or even think what it is he even wants and this is what makes Red's tale a tragedy. Red's life is entirely one of possibility, never of actuality, but when confronted with an object that could make all of his desired possibilities actual, he finds himself completely frozen, unable to choose a possibility he would like to actualise. Red is frozen not just because he has lived his life in hope and hunger for something else but because that hunger, and the knowledge that things can change, utterly define his existence. To pick a possibility and live with it is to be expelled from the land of perpetual becoming that the Stalkers inhabit, and that is not living at all. In Stalker, Red and the men he accompanies struggle with the possibility of whether or not to enter the room where their hearts' desires will be granted. Like Red in the book, they would rather define themselves through hope for some undefined better thing than receive that wish and forever lose their identities. The relationship between hope and identity also encapsulates the ideas put forward by McCarthy in The Road. It is telling that just as The Road ends with talk of spirituality and "the breath of God," Roadside Picnic ends with Red addressing the ball as though he were talking to God. In fact, one of the differences between Roadside Picnic and Stalker is the inclusion of talk of explicit spirituality at the end of the latter. Roadside Picnic is less than one hundred and fifty pages and is as tight as a drum. Nary a word or an idea is out of place or surplus to the book's Spartan yet stringent demands. Its playful use of nicknames gives the text an up-beat and slightly mischievous feel, but in a way this is part of a deliberate deception. Of course the characters are up-beat, since they might well stumble into their hearts' desires, but the horrific mortality rate of Stalkers (by the end of the book all the old Stalkers have died off, with remote-controlled robots doing all the exploration) reveals the true message of the book: hope is a wonderful thing, but it can also destroy and end those lives that it comes to define. Jonathan McCalmont lives in London where he teaches, writes, and gets up out of his chair, goes to the window and sticks his head out and yells "I'm as mad as hell and I'm not going to take this anymore." He also blogs about films and books at www.sfdiplomat.net. Nice review. What is missed though, is that golden ball grants onlytrue wishes of a person. Redrick wants to help his daughter but afraids that instead of it ball will grant him money or health or whatever he truly wishes for himself not for others. Nice point Victor. You're right, I hadn't picked up on that interpretation of the ending and your point does add extra depth to his soul searching. He's soul searching because when confronted with an actual wish rather than the desire to wish and change things, he realises that there's nothing there... he has no true wish. So he starts fishing around inside himself and begs the ball to do it for him and sits there hoping that what is inside him is a person with a good true wish, not a selfish one. Yes, I've just read this and then rewatched Stalker afterwards. There is an interesting discussion of Roadside Picnic in Fredric Jameson's Archaelogies of the Future, in which it forms one of his key case studies for discussing the problems of representing Utopia. This review and subsequent comment are facinating - I think this book, like Kafka's work, is like an extended zen parable and we could go on discussing it for a long time. The element of the ending that I picked up on was that the structure creates something like a kierkegaardian 'teleological suspension of the ethical'. Red's final wish for happiness is not a falsely optimistic hope like that of the rather naive young man who has just been sacrificed to the 'meat-mincer', but a 'hope' that is born from an almost desperate leap of faith from cynicism. As such, it is separated from the double-edged 'progress' which charcterised twentieth-century modernity (whether Soviet or Western). I see the film slightly differently than as described in the above review. Red's two companions, a writer and a scientist, represent the 'intelligentsia' and the film is a bitter indictment of their failing to maintain 'hope' (in the kierkegaardian sense) rather than self-interested notions of progress. There is also a nice irony, in full-blown arthouse cinema being used to attack the intelligentsia and uphold the (pulp) values of the original sf book. This is an example of Jameson's point that the pulpiness of sf is integral to its value and its capacity to explore questions of utopia. The other great thing about the film is the shiver-inducing final scene where the child (who is nearly always shot in colour as opposed to the murkiness of the rest of the world outside the zone) displays telekinetic powers and prefigures a future beyond the 'more of the same' which progress always seems to chuck at us. Any idea if this will ever be released in the US? Even used copied go for nearly $100 here and I've been wanting to read this for years. "HAPPINESS FOR EVERYBODY, FREE, AND NO ONE WILL GO AWAY UNSATISFIED"
"Никто не уйдет обиженным - Nikto ne uidet obizennim". "Obizennim" - is more like " offended, having grudge". Could almost mean - make them happy, even if they do not want it, event if they do not understand what is it. I keep promoting this novel to all and sundry. I hear there's a film being made for release in 2008. I also agree with Victor. While getting to the Golden Ball Red tells himself that if Arthur dies , he did so for the sake of his daughter. However he is actually lying to himself, because deep down he knows that hes actually in it for the money. As he gets to the ball he finally realises his true intentions and hopes that the ball will look into him and reveal a truly good man by granting his deepest wish. Прочитал первую из двух статей. Такое ощущение, что её автор, "этот самый Дж. Мак-Калмонт", немного не в себе. Впрочем, он и сам того же мнения: "Jonathan McCalmont lives in London where he teaches, writes, and gets up out of his chair, goes to the window and sticks his head out and yells "I'm as mad as hell and I'm not going to take this anymore." Однако, нужно отдать ему должное, когда его тычут носом, он соглашается и не спорит. Там, в комментариях, явно русские ребята кое-что ему пытались объяснить. Why do you believe the author, he is really mad? I think, he is just self-ironical. What do you consider particularly wrong in the article? Please speak English, when discussing posts in this sub-forum. Or duplicate your message in English. Or you may start a parallel topic in Russian. Sorry, I didn`t notice what subforum this topic had been created in. To start a parallel topic in Russian one have to translate the articles and all. It will be a piece of work! Count me out. Surely author was ironical. So did I. What particularly wrong with this article? "The tunnel vision" I suppose. Its thesis "that the Zone as a whole can be taken as symbolising hope, aspiration, and the realm of possibilities and probabilities" I consider to be very interesting, but I have an impression that J.M. do not see other ideas in this book. May be I am wrong. And I don`t understand that adjective, up-beat. I don't agree on 'tunnel vision', it's quite a small article, and thus it considers a limited range of ideas. But certainly not only one. For example, Mr. McCalmont speaks not only about Zone, but also about Red's motivation at the Golden Ball (I personally prefer to name it а Golden Sphere.) Then he discusses it further in comments. The author reasonably argues against a primitive and loosely understanding of 'Roadside Picnic' as an anti-Soviet satire. Also he compares 'Roadside Picnic' to other post-apocalyptic sci-fi novels like Algys Budry's 'Rogue Moon' or Frederik Pohl's 'Gateway' and McCarthy's 'The Road'. Unfortunately, I'd never read these books, and can't judge, how reasonable his conclusions are. 'Up-beat' is originally a musical term, used informally to designate something optimistic or cheerful.